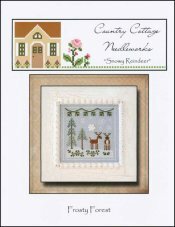 Frosty Forest: Snowy Reindeer [H5394] - $6.50 : Yarn Tree, Your wholesale source for cross stitch supplies. "Snowy Reindeer" is chart eight of nine in the Frosty Forest series. Stitch count 65w x 65h. Stitched on 32ct Linen. Weathered Roses Aida 18 Short Cut 11.5"x43"
Opalescent White Aida 18 Short Cut 25"x43"